These are really easy to make and keep in the fridge for at least a month, meaning that if you’re currently in the throes of some virtuous New Years resolution you don’t have to eat them all at once (although you also definitely could just do exactly that). Put the almond meal, cashews, dates, maple syrup, cocoa powder, vanilla essence and salt in a food processor and blend until it forms a sticky dough (be patient, this may take a little bit). Melt the dark chocolate. You can do this by heating it in the microwave in 10 second bursts, stirring in between each burst. Be careful not to overcook the chocolate or it will go crumbly and dry and weird. Once the chocolate is melted, add the finely diced peanuts and mix well to combine. 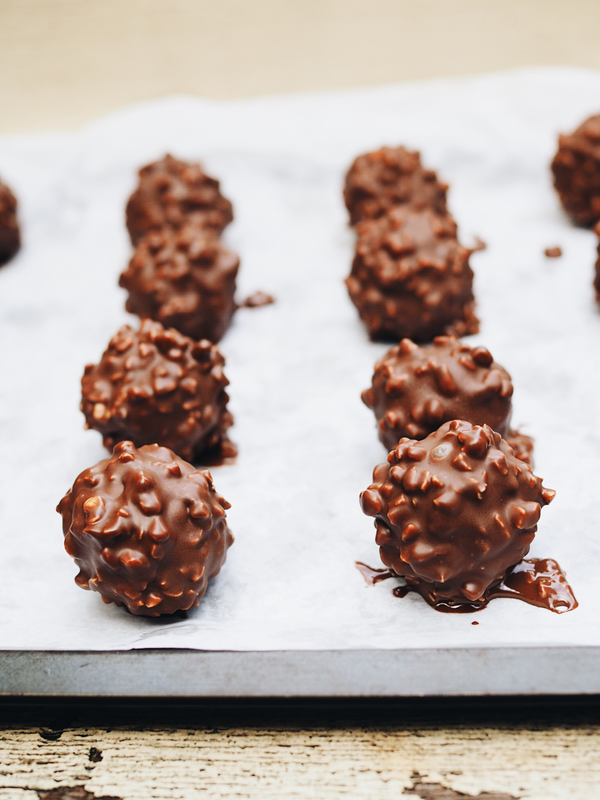 While the chocolate-peanut mix is still runny, take your frozen bliss balls, and dunk them one-by-one in the molten chocolate, making sure they are covered all over (they should look like Ferrero Rochers now). Return to the freezer for 20 minutes to harden, then eat!